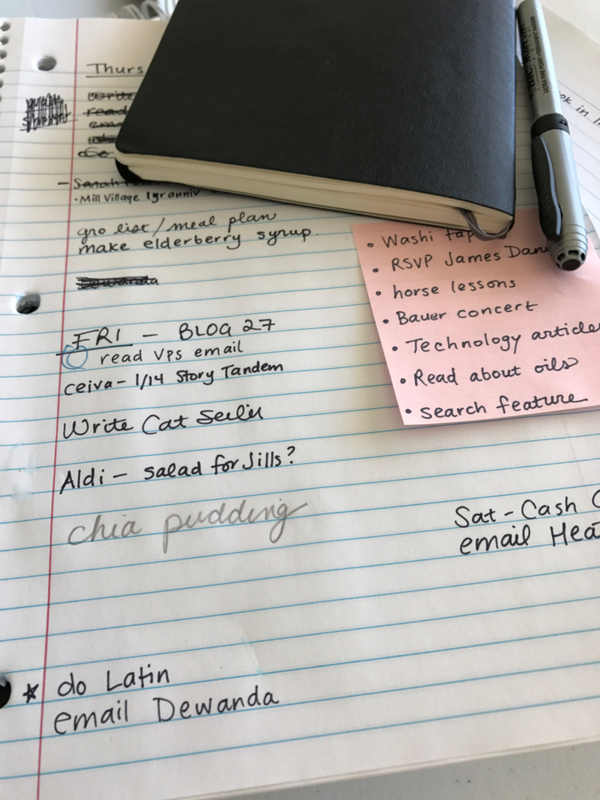 January Journal: Day 27 — Ginger writes. Yesterday I took my own advice and quit staying up too late. I quit for one day at least. It was close to 10pm, and I wanted so badly to stay up and either do this weekend's Latin assignment to keep up with Bauer or to write a letter to my friend Catherine. I would have gladly done either, because either would have been productive and fun (yes, I find the challenge of Latin fun). What would thirty extra minutes awake have mattered to have another thing checked off my list? It went against my nature to make myself choose to do neither. Instead, I chose to get in bed and read for a few minutes because I knew reading would help me fall asleep instead of making my brain engage in a wakeful way as Latin or letter writing would. I was interrupted once ten minutes into my reading by Sailor crying, and then again, two hours into sleep by Story in my room asking for her unfinished applesauce from before bed. Other than that, my sleep was sound. It is rare that I wake up fully rested, but setting aside Latin and a letter pushed me in that direction. I still haven't written my letter, which I am eager to do, but I did get a good chunk of the Latin work done alongside Bauer during our homeschool time this morning. My evening activities pile up on days like this, when Sailor's nap is less than forty-five minutes (again! ), and my blog post for today wasn't even started by the time she woke up. It's probably best, from now on, to call my list: Some Things That May Happen. With not a thing yet marked off, and with the time approaching 3pm, let's just say I won't be bored before bed tonight. I'm not promising to write the letter or finish the Latin or make the pudding or work on my grocery list or send any emails. I hope to do some of those things if kids and bedtimes cooperate. But for sure I'll make us a nice dinner, and finish reading aloud our chapter from The Wind in the Willows, and check over Bauer's math, and do my best to put the kids to bed patiently, and maybe even see that baths are taken first. And then after (or before) my work is done, I'll choose to get in bed and read because that list is just a list. Look, It Says "Tomorrow."